Back of Beyond Baking: Full steam ahead! I really do not know where to start with all the goings on here in the Back Of Beyond over the last few weeks. We had the family wedding of the year which entailed the making of the 6 inch cutting cake and 65 cupcakes. Prior to that I tried out the Cakesaway postable cake box and since then made cakes for my nanny girlfriends, invited the environmental health inspector round to approve my kitchen and also produced Valentines Day cupcakes in a gorgeous cupcake handbag. 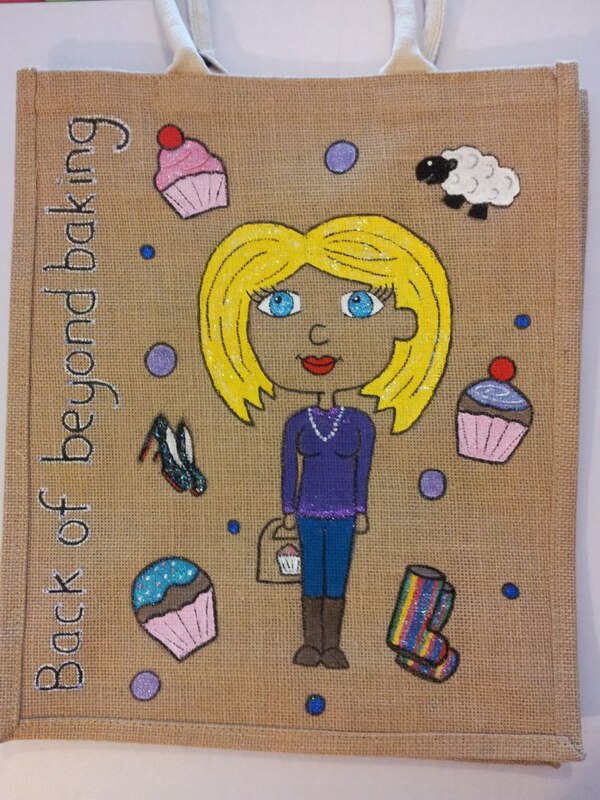 Oh and bought www.backofbeyondbaking.co.uk so you can find me easily! Let's go back a couple of weeks to the postable box. This little box is the cupcake makers dream. It allows one to post 6 cupcakes to anywhere via Royal Mail (special delivery recommended) and have the cupcakes arrive in perfect condition with the recipient. The secret is the domed pod that the cupcake sits in and the manufacturers provide cupcake cases so that the cupcakes are the correct size and will sit happily in their pod. If tipped upside down the cake won't slide into the lid. I was a little suspicious about these claims which is why I sent my dear friend Gem a box to test one out. The last thing I wanted as a new business was to send out cakes that ended up squished in transit! I made gluten free cupcakes which are particularly fragile and decorated them with a variety of toppings to check the best topping to transport as the ultimate road test. 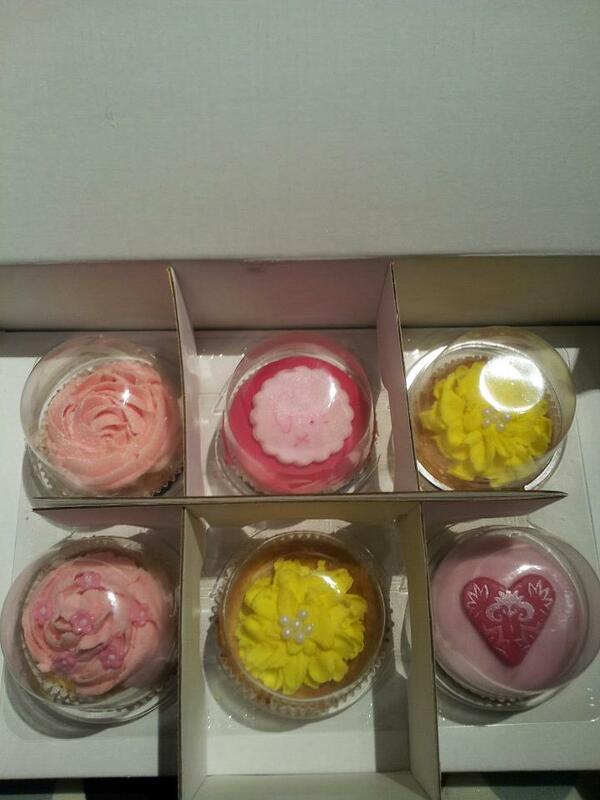 I waited with baited breath for Gem to get in touch once she recieved her cakes. Well I should not be such a doubting Thomas because the picture she sent me was almost identical to the photo I had taken prior to posting! After! Can you spot the difference! From this trial Back Of Beyond Baking cupcakes by post has been born! I have already had two orders posted out and 3 more due next week. So Moving on to the wedding which really has galvanised the desire to make cakes for a living. In the weeks leading up to it I was fairly nervous but developed a plan of action for the cake making days and stuck to my plan. By 10am on the day of the big cupcake bake I had all the cakes out of the oven and then the production line of producing the finished item started. I had Mr V-C on washing up duty and then as the hours ticked down I had him buttercreaming the cakes and kneading fondant ready for rolling. He was an absolute star and I couldn't have done it without him. By 4pm we had 72 cupcakes baked and decorated (including 6 for the nannies decorated with buttercream hydrangea flowers and chocolate hearts). Poor Mr V-C had the unenviable task of driving us the 150 miles to the wedding venue with all the cakes on board. I had prepared for possible mishaps with a spare large rose and small flowers, roses and fondant icing all ready for repairs. Thankfully all travelled beautifully, no repairs necessary and we definitely breathed a sigh of relief when we delivered and set up the cake. The Bride and Groom were very happy with their cake and apart from a few timing issues at the beginning of service the day passed smoothly. In fact I can happily say it was one of the best days I've had in over a year! And more importantly I recieved tons of compliments on the cakes! Having now done this I feel more confident in my ability to cope with a big order in future, so bring it on! And finally this week I have had enviromental health visit to check my kitchen which was a bit underwhelming (I had scrubbed my kitchen from top to bottom and she didn't swab anything!) and was swiftly certified as satisfactory for manufacturing cakes. Sadly I am exempt from the new rating system so don't get any gold stars but the officer was quite happy with everything I have in place and my cleaning practices. I will just have to give myself a gold star! So now officially I am in business!! I just wanted to say thank you for letting me be a guinnea pig for your first ever postal delivery. Not only did the cakes arrive as they left you, but they were totally delicious and GLUTEN-FREE!!! You are a total star! I ate all but one of them. No way I could choose which ones to share with the family so I hid them from Katie and gave Daddy just the one! !